(Rick Bowmer | AP Photo) Austin Boutain, center, looks on during a court hearing Wednesday, Sept. 12, 2018, in Salt Lake City. Boutain, an ex-convict charged with gunning down a University of Utah student from China, using a stolen gun from a previous killing, pleaded guilty to murder and kidnapping charges. Boutain entered the pleas in an agreement with prosecutors that allows him to avoid a possible death penalty. He was sentenced to life without parole. Nearly a year after he shot and killed a University of Utah student, Austin Boutain stood in a Salt Lake City courtroom Wednesday and calmly admitted his guilt. In October, Boutain, 24, shot five times into a car that sat in a dirt parking lot in Red Butte Canyon, one of the bullets striking and killing 23-year-old Chenwei Guo, a computer science major from China. And after he killed Guo, Boutain ordered the passenger out of the car and fired his gun towards her — but missed — as she ran. For these crimes, Boutain agreed to be sentenced to spend the rest of his life in the Utah State Prison. (Rick Bowmer | AP Photo) Austin Boutain looks on during a court hearing Wednesday, Sept. 12, 2018, in Salt Lake City. Boutain, an ex-convict charged with gunning down a University of Utah student from China, using a stolen gun from a previous killing, pleaded guilty to murder and kidnapping charges. Boutain entered the pleas in an agreement with prosecutors that allows him to avoid a possible death penalty. He was sentenced to life without parole. Boutain pleaded guilty Wednesday to aggravated murder, attempted aggravated murder and aggravated kidnapping. Then, 3rd District Judge Richard McKelvie immediately sentenced him to a life term in prison without the possibility of parole. Boutain could have faced the death penalty, but Wednesday’s plea deal spared him execution. Guo’s parents were in support of the resolution, Deputy Salt Lake County District Attorney Chou Chou Collins told the judge. As for Guo’s friend, whom Boutain fired shots at, Collins said she also was in support of the plea deal and is working to cope with what happened. Boutain’s parents attended Wednesday’s hearing, but did not speak in court. Their son’s attorney, Michael Sikora, said after the hearing that they were sorry for what happened. “They are praying for the victims and the victim’s families,” Sikora said, adding his client also felt remorse. Boutain and his wife, Kathleen Boutain, are accused of traveling to Utah days after they killed another man in Colorado. Charging records allege that the couple told police they sat in the dirt parking lot on Oct. 30 and hatched a plan to kidnap someone. They would use the victim’s money and credit cards to buy supplies, charging documents state, and they planned to kill the victim once they reached Tennessee. Alternatively, they considered killing the victim in Red Butte Canyon and taking the vehicle, they told police. But as they sat contemplating who their target might be, Kathleen Boutain became irritated, authorities say, because it was taking too long. She implied that “Austin was a coward,” documents state, and they got into a physical confrontation before she left. At 8 p.m., she told University of Utah police that her husband had killed someone (apparently referring to the Colorado homicide), had pistol-whipped her with one of his two guns and would kill someone to get a vehicle, court documents state. Back at the canyon, a car arrived at the parking lot. Austin Boutain approached, reportedly with the intention of asking whether its occupants had seen Kathleen Boutain. He said he knocked on the window several times to no response and then yelled. Guo started to make a U-turn. Enraged, Austin Boutain fired a handgun at the driver’s side window, police documents say. Boutain then retrieved his and his wife’s possessions and returned to the car, intending to steal it when he heard a woman’s voice. Guo’s friend was still in the car, talking to a police dispatcher. Boutain later told police he “walked up the hill and sat down for a few minutes before deciding to return to the vehicle and kill the female,” documents state. He opened the passenger-side door, told her to turn off the phone and get out of the car. The woman did and threw her phone on the ground. When Boutain bent down to turn off the phone, she ran away as he fired shots at her. Despite a police search in the foothills area, Boutain was able to escape. However, he was arrested more than 14 hours later at the downtown Salt Lake City library. 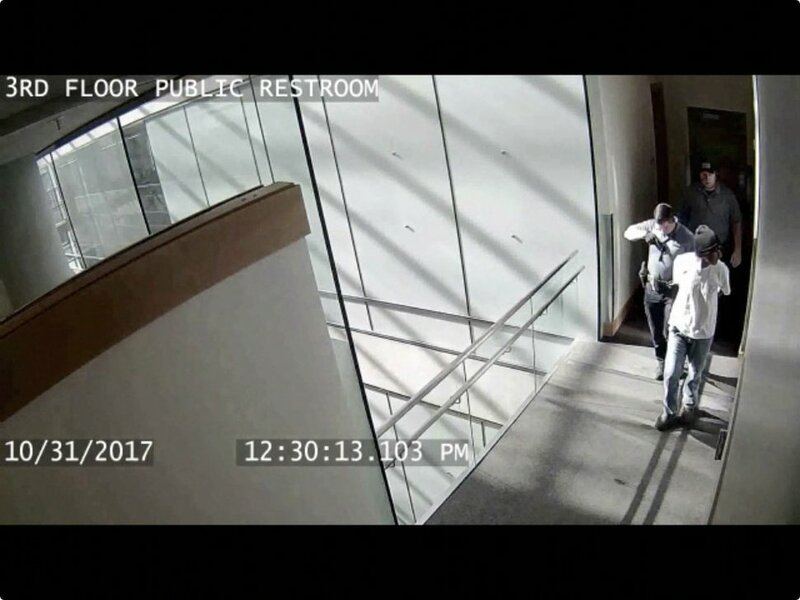 (Photo courtesy of Salt Lake Lake City Main Library) A video still of Austin Boutain's arrest at the downtown library in Salt Lake City. Boutain is the suspect in the Oct. 30, 2017, attempted carjacking and fatal shooting of a University of Utah student near Red Butte Canyon. Kathleen Boutain is not facing murder charges in Utah, but she is accused of criminal solicitation and theft by receiving stolen property. Her case is still pending. Both Boutains have been charged in Colorado in the Oct. 27 death of 63-year-old Mitchell Bradford Ingle. Sikora said after Wednesday’s hearing that he expects Colorado authorities to get his client at some point so he can face charges there. “We are certainly hoping for the same result out there,” Sikora said. Boutain also pleaded guilty Wednesday in two other cases — assault by a prisoner for stabbing a fellow jail inmate with a shank in January and damaging a jail cell for breaking a sprinkler head and flooding his cell in March. His prison sentences for those charges will run concurrent to his life sentence.